NAIROBI, Kenya, February 25, 2013 (ENS) – Ministers and high-level officials from 193 countries dined on perfectly good food grown by Kenyan farmers but rejected by UK supermarkets for cosmetic imperfections at UN Environment Programme, UNEP, headquarters in Nairobi. Chef Ray Cournede from Nairobi’s prestigious Windsor Hotel utilized the rescued food to cook a five-course meal that included grilled sweet corn tamales, yellow lentil dal with tamarind, mango chutney, and mangomisu, which is the Italian dessert tiramisu with mangoes for a tropical twist. 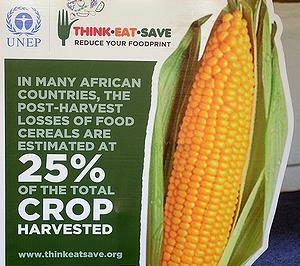 The zero-waste reception was held Tuesday to mark the first UNEP Governing Council that included all the world’s countries and in support of Think.Eat.Save. Reduce Your Foodprint – a campaign launched by UNEP and partners in January to reduce food loss and waste. The campaign aims to promote actions by consumers and food retailers to cut the 1.3 billion metric tonnes of food lost or wasted each year around the world, particularly food wasted by consumers, retailers and the hospitality industry. Tristram Stuart, food waste author and founder of the British charity Feeding the 5000, a partner organization that has organized such dinners for years, visited producers across Kenya to source around 1,600 kilograms (3,527 pounds) of unwanted fruit and vegetables for the meal and for donation to local charities. 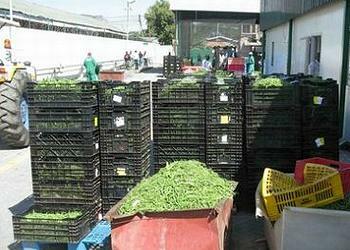 The food had been grown for the export market only to be rejected due to stringent standards over appearance or orders being changed after vegetables had been harvested. Some unwanted produce is sold on the local market or donated, but the quantities are so large that local markets cannot handle the volume. Much of it is either left to rot or fed to livestock, prompting resentment amongst Kenyan farmers who must bear the costs. In Europe and North America, Australia and New Zealand, per capita waste by consumers amounts to between 95 and 115 kilograms a year, while consumers in sub-Saharan Africa, south Asia and southeast Asia each throw away between six to 11 kg of food a year. The global food system stresses the environment, says UNEP, and producing more food than is consumed only increases pressure on land and waters. More than 20 percent of all cultivated land, 30 percent of forests and 10 percent of grasslands are being degraded. Agriculture and land use changes like deforestation contribute to more than 30 percent of total global greenhouse gas emissions. Globally, nine percent of the freshwater resources are withdrawn, 70 percent of this by irrigated agriculture. Overfishing and poor management contribute to fish declines; some 30 percent of marine fish stocks are now considered overexploited. The Think.Eat.Save. Reduce Your Foodprint campaign supports the SAVE FOOD Initiative run by the UN Food and Agriculture Organization and German trade fair organizer Messe Düsseldorf and supported by UN Secretary General Ban Ki-moon’s Zero Hunger Initiatives. “Together, we can reverse this unacceptable trend and improve lives,” he said. Worldwide, at least one-third of all food produced, worth around US$1 trillion, gets lost or wasted in food production and consumption systems, according to the FAO. Food loss occurs during harvesting, processing and distribution, while food waste takes place at the retailer and consumer links in the food supply chain. The FAO finds that 95 percent of food loss and waste in developing countries are unintentional losses at early stages of the food supply chain due to financial, managerial and technical limitations in harvesting techniques, storage and cooling facilities in difficult climatic conditions, infrastructure, packaging and marketing systems. In the developed world, at the food manufacturing and retail level, much food is wasted due to inefficient practices, quality standards that over-emphasize appearance and confusion over date labels. Then consumers throw away edible food due to over-buying, inappropriate storage and preparing meals that are too large. 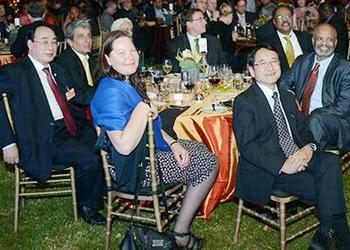 The UNEP dinner was a zero-waste event. Guests bagged leftovers and many of the fruits and vegetables were donated to MCEDO, a community organization that runs a school with a feeding program for 580 children in Nairobi’s Mathare informal settlement. Entertaining at the dinner were Kenyan singing sensations Eric Wainaina and Suzanna Owiyo, who support the anti-food-waste campaign as National Goodwill Ambassadors.